The 1840s revolutionized dentistry. Dentists discovered they could make a paste out of silver and mercury that they could use to fill the hole left by drilling out a cavity. This paste would then harden and last for years. They dubbed them silver fillings, though they are made mostly of mercury. 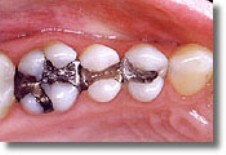 Dentists may use the technical term amalgam for these type of fillings. Amalgam fillings have been the standard practice ever since, with little advances in over a century and a half. Then, in the 1980s, two more technological breakthroughs occurred that again revolutionized dentistry. First, a white composite, mercury-free filling material was advanced to the point that it could be made not only strong enough, but with enough wear resistance to hold up even on the back teeth. 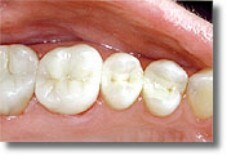 Second, new bonding technologies developed that allowed these new composite fillings to be bonded directly to the teeth. Sometimes professionals are reluctant to accept new ways of doing things, instead, preferring to stick with what they know. Dr. Bader, however, embraced the new technology when he realized its many advantages. Not all dentists have been trained in composite fillings. The process wasn’t taught in dental schools until fairly recently. As a result, dentists had to get additional training to be proficient in the new method. Even today, not all dental schools teach it, so you’ll want to be sure to get a dentist experienced with composite fillings. While amalgam fillings weaken tooth structure, composite fillings are bonded directly to the teeth, thereby strengthening the tooth. If you’re filling a new cavity, much less tooth structure has to be removed with composite fillings, than you would have to remove with amalgam fillings. There is less post operative sensitivity with composite fillings. Amalgam, being a metal, conducts hot and cold readily where composite insulates the tooth. Composite fillings look much more like your natural tooth. If you need a filling, and are looking for a mercury-free dentist, feel free to call our office (617-795-7170) to set an appointment, or visit our request an appointment page.